For quick sketch part two, I am going to cover establishing the gesture. The most common mistake people make in drawing the gesture is they try to get too specific to early. 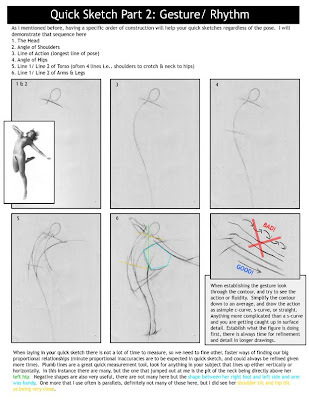 Do yourself a favor and draw the simple action and relationships of the figure. Detail only interferes with getting the big picture and capturing the energy of the figure. again great tutorial! Ii thinking about how reily method help in work form imagination ? Thanks for these notes on quicksketch. I have a question. I am getting pretty good at doing quick sketches of standing models, but when they go into a laying down or turtle position or extreme foreshortening I have a great deal of trouble. I am not sure why this is happening, but I have a block with it. Can you advise on how to get past this?